An SUV rollover lawyer understands that vehicle accidents involving rollovers in SUVs, trucks and vans account for more than 10,000 traffic fatalities and countless serious injuries every year on U.S roads and highways. As a dedicated rollover lawyer, David P. Willis knows that this high number of rollover accidents, deaths and injuries is due in great part to vehicle manufacturer design defects and flaws. The lack of proper protection and safety features in most SUV’s, trucks and vans also contributes many times to the severity of injuries suffered. It has been shown that these features are often omitted as minor cost saving measures during the design and manufacturing process. Many times drivers are incorrectly assigned fault for a rollover wreck, when the fault and cause of the rollover accident may actually lie in a poorly designed SUV or a poorly constructed tire. Poor tire design and construction resulting in tire defects, tire tread separation and tire failure are some of the most frequent initial causes of SUV, truck and van rollover accidents. Attorney David P. Willis is a nationally recognized and Board Certified personal injury trial lawyer with over 27 years of experience in Products Liability and Personal Injury Law. Mr. Willis was involved in one of the nation’s first Firestone ATX Radial Tread / Belt Separation and Ford Explorer rollover cases. A products liability lawsuit was filed in 1998 against Ford and Firestone due to the Ford Explorer going out of control and rolling after the back left Firestone ATX radial tire’s tread came off. After a long battle with Ford and Firestone, a confidential settlement was reached by all parties.On July 17, 2001, Mr. Willis was recognized as one of a very select group of products liability attorneys in the nation and was awarded the prestigious Steven J. Sharp Public Service Award for his contributions in investigating and gathering evidence pertaining to tire belt separation and vehicle rollovers in Firestone Tire and Ford Explorer Cases. The efforts by these selected attorneys and others helped lead to the largest recall in U.S. history, with millions of vehicles being recalled. According to National Highway Transportation Safety Administration (NHTSA) rollover statistics, SUV’s have the highest rollover accident rate of any class of vehicle. Poorly designed vehicles often cause or contribute to the high rollover rate and to the severe injuries that often occur in rollover accidents. 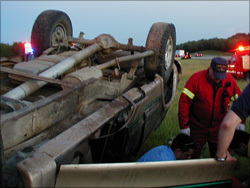 Occupants in a rollover accident are often injured when the vehicle’s weak roof supports and roof pillars collapse under the weight of the vehicle. Roof crush, roof collapse, roof pillar failures account for many serious injuries and death each year in rollover wrecks. Once rollover accidents occur, drivers or occupants may also sustain additional and often severe injuries resulting from seat belt defects, seatback failures, door lock & door latch failures, airbag deployment defects & failures, lap only seat belts, and possibly subsequent fuel fed fires. The Willis Law Firm has successfully assisted clients with rollover accidents, seat belt failures, tire tread separations and roof crush cases throughout the United States involving SUV Rollovers, Passenger Car Rollovers, 15 Passenger Van Rollovers, Pickup Truck Rollovers, and ATV Accidents & Rollovers, including major manufacturers such as Ford, Chevrolet, GMC, Toyota, Nissan, Mitsubishi, Jeep, Isuzu, Dodge, Firestone Tire, Cooper Tire, Goodyear Tire, Bridgestone Tire, etc.